John Jackson was born in 1811, the son of Henry and Lucy Jackson. He was educated at Reading School under Richard Valpy, and at Pembroke College, Oxford. 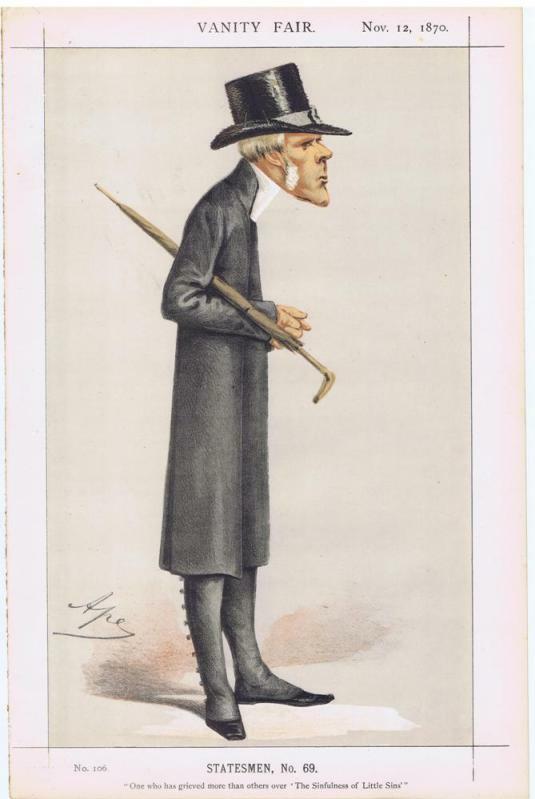 In 1835 Jackson was ordained deacon and began pastoral work as a curate at Henley-on-Thames. This he left in 1836 to become head-master of the Islington proprietary school. Settled in North London, Jackson rapidly won a position as a preacher. As evening lecturer at Stoke Newington parish church, he delivered the sermons on ‘The Sinfulness of Little Sins,’ the most successful of his published works. In 1842 he was appointed first incumbent of St. James’s, Muswell Hill, while retaining his educational post. In 1845 his university made him one of its select preachers, an honour repeated several times. In 1853 Jackson was Boyle lecturer, and in the same year he was made vicar of St James, Piccadilly. 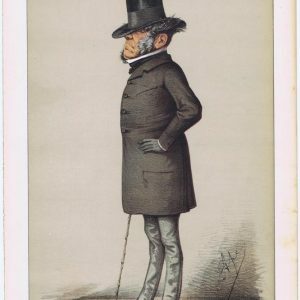 Augustus Buckland says that ‘there his reputation as a good organiser and a thoughtful, if not brilliant, preacher steadily grew”. 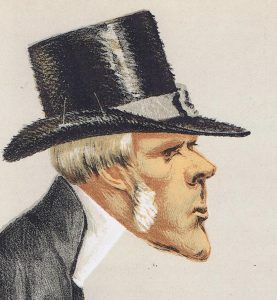 Jackson was appointed ‘chaplain in ordinary’ to the queen in 1847, and canon of Bristol in 1853. Jackson was appointed Bishop of Lincoln in 1853 and consecrated by John Bird Sumner, Archbishop of Canterbury, on 5 May at St Mary-at-Lambeth. The choice was widely approved. He welded together the counties of Lincoln and Nottingham, stimulated the educational work of the diocese, and raised the tone of its clergy. In convocation he was active, but rarely spoke in the House of Lords. 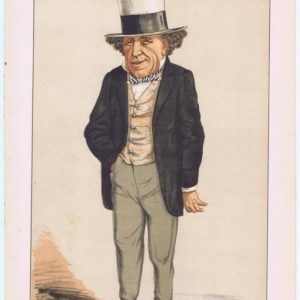 In 1868, Jackson was unexpectedly selected by Benjamin Disraeli, then prime minister, to be Bishop of London where he continued until his retirement in 1885. According to Buckland, “Jackson had the mind of a lawyer, and was a thorough man of business”. Despite grave anxieties over ritual prosecutions, he achieved much that was valuable. 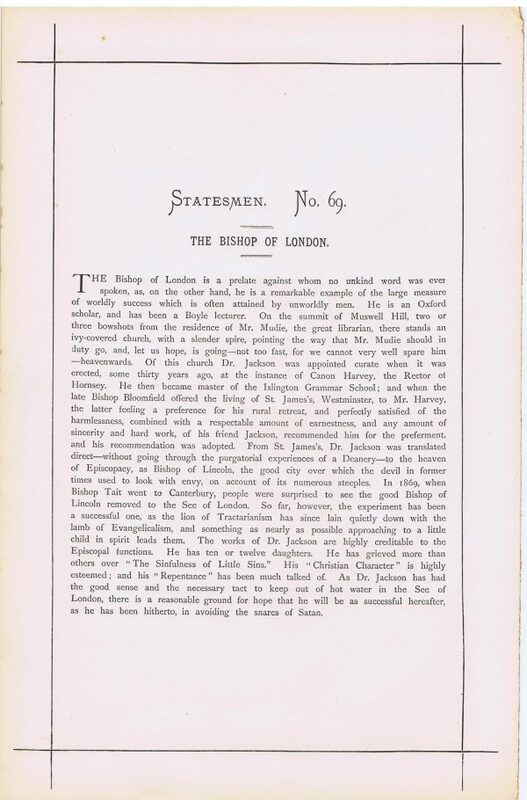 Jackson energetically supported the Bishop of London’s Fund, encouraged the organisation of lay help, and, after much hesitation, created a diocesan conference. 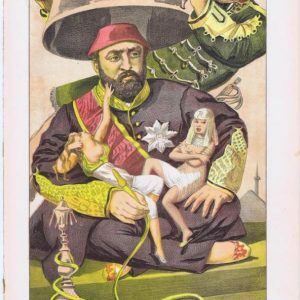 Published: 12-Nov-1870 Signed by: APE, Carlo Pellegrini . Dimensions approximately 23cm x 35cm.